An animated feature film is defined as a motion picture with a running time of more than 40 minutes, in which movement and characters' performances are created using a frame-by-frame technique. Motion capture by itself is not an animation technique. In addition, a significant number of the major characters must be animated, and animation must figure in no less than 75 percent of the picture's running time. The chart below lists the highest-grossing animated films. Figures are given in United States dollars (USD). Many films that were released during the 20th century do not appear on this list as figures have not been adjusted for inflation. 94% of the films in the top 50 were released after 2000. 2016 is the most represented year on the list, with six films. Shrek is the most represented franchise, with five films. Pixar is the most represented studio on the list, with 15 films. The films on this list have all had a theatrical run (including re-releases) since 1993. Films that have not played since then do not appear on the chart due to ticket price inflation, population size, and ticket purchasing trends not being considered. Animated/live-action films can be considered for this list if they meet the criteria that 75% of footage is animation and a significant number of major characters are animated. The following chart is a list of the highest-grossing computer animated films. 98% of films in the top 50 were released after 2000. 2016 is the most represented year on the list with six films. All feature films in the Despicable Me, How to Train Your Dragon, Rio, Kung Fu Panda, Shrek, Finding Nemo and Incredibles franchises, as well as the main films in the Madagascar franchise, are on the list while the Toy Story and Ice Age franchises feature often. Shrek is the most represented franchise with five films. DreamWorks Animation is the most represented studio on the list with 16 films. The top 47 films listed are also among the 50 highest-grossing animated films, the top nine are among the 50 highest-grossing films, and the top seven have each grossed in excess of $1 billion worldwide. The films on this chart have all had a theatrical run (including re-releases) since 2001, and films that have not played since then do not appear on the chart due to ticket price inflation, population size and ticket purchasing trends not being considered. The following chart is a list of the highest-grossing stop motion films. Films had to surpass $10 million to qualify for this list. 88% of the top 17 were released after 2000. 2012 is the most represented year on the list, with three films. Laika is the most represented studio, with five films on the list. All stop motion feature films by Aardman, DreamWorks Animation, Laika, and Tim Burton are on the list. All feature films in the Wallace and Gromit and Solan & Ludvig franchises are on the list, both of which are the most represented franchises on the list, with two films each. The films on this chart have all had a theatrical run (including re-releases) since 1996, and films that have not played since then do not appear on the chart due to ticket price inflation, population size and ticket purchasing trends not being considered. After adjusted for inflation, Chicken Run will appear on top with a gross of $402000000. The following chart is a list of the highest-grossing traditionally-animated films. 44% of the films in the top 50 were released after 2000. 1998 and 2002 are the most represented years on the list, with four films each. All films in the main Peter Pan, The Jungle Book and SpongeBob SquarePants series appear in the chart, while the Rugrats, Mickey Mouse and Pokémon franchises feature prominently. All of these five franchises are also the most represented, with two films each. Disney is the most represented studio, with 27 films on the list. The top three films on this list are also among on the 50 highest-grossing animated films. Only The Lion King is among on the 50 highest-grossing films, ranking in at 41. The films on this chart have all had a theatrical run (including re-releases) since 1972, and films that have not played since then do not appear on the chart due to ticket price inflation, population size and ticket purchasing trends not being considered. Computer-animated films have been the highest earners in 1995 and every year since 1998, while 1975 and 1993 are the only years when a stop motion animated feature grossed the highest. Traditional animated films have topped every other year. All films in the Toy Story, Rescuers, and Finding Nemo franchises were the highest-grossing animated films of the year they were released. The Ice Age and Doraemon franchises have had the most entries be the high-grossing animated films by year, with four films each. Disney has the most top grossing by year, with 31 films. N/ANot applicable; no animated feature length film was released in that year. At least seven animated films have held the record of highest-grossing animated film at different times. Four of these were Disney films and two by Pixar. Shrek 2, made by DreamWorks Animation, is the only film on the list not produced by Disney or Pixar. Snow White held the record for the longest, with 55 years, while Finding Nemo held it for the shortest period of a year. The Lion King was the last non-CG animated film to hold the record. Shrek 2 and Toy Story 3 are the only sequels to hold the record. Finding Nemo was the first CG animated film. All of these films are still among the highest-grossing animated films except Snow White, and only Snow White, Aladdin and Shrek are not also among the highest-grossing films. The following chart is a list of the highest-grossing animated film franchises. The top four are among the highest-grossing film franchises of all time and, respectively, are ranked 15th, 17th, 19th, and 24th of all time. The Despicable Me is the highest-grossing animated franchise of all time with $3.7 billion; it is also the only animated franchise with two films grossing over $1 billion worldwide. The Finding Nemo franchise has the highest per-film average, with over $984 million unadjusted. All franchises by Pixar (the most represented studio with five franchises), DreamWorks Animation, Blue Sky and 20th Century Fox, are on the list. A given franchise needs to have at least two theatrically released films to be on this list. ^ a b c d Box Office Mojo stopped updating its main total for Frozen in August 2014, while it was still in release. The total listed here incorporates subsequent earnings in Japan, Nigeria, Spain, the United Kingdom and Germany up to the end of 2015, but omits earnings in Turkey, Iceland, Brazil, and Australia (2016) which amount to a few hundred thousand dollars. The total is rounded to $1 million to compensate for the numerical inaccuracy. ^ Disney issued an erratum to the gross for The Lion King, correcting its gross from $987.5 million to $968.5 million. This means that Despicable Me 2 finished its run ahead of it and would have ranked one place higher at the end of its release. ^ Snow White earned $8.5 million in gross rental upon its initial release, in the process becoming the highest-grossing sound film. The gross rental is the distributor's share of the box-office gross and was more commonly reported than the exhibition gross up to the 1970s. ^ It is possible Aladdin never took the record. Aladdin's release (1992–93) coincided with a Snow White reissue, and it is possible that Snow White ended up grossing more. Snow White had grossed a total of $330 million up to 1987, and then added a further $88 million in North America from its 1987 and 1993 reissues; it is unknown how much Snow White made from these reissues outside of North America, but if the foreign gross matched or exceeded the North American gross then Snow White would have earned more. 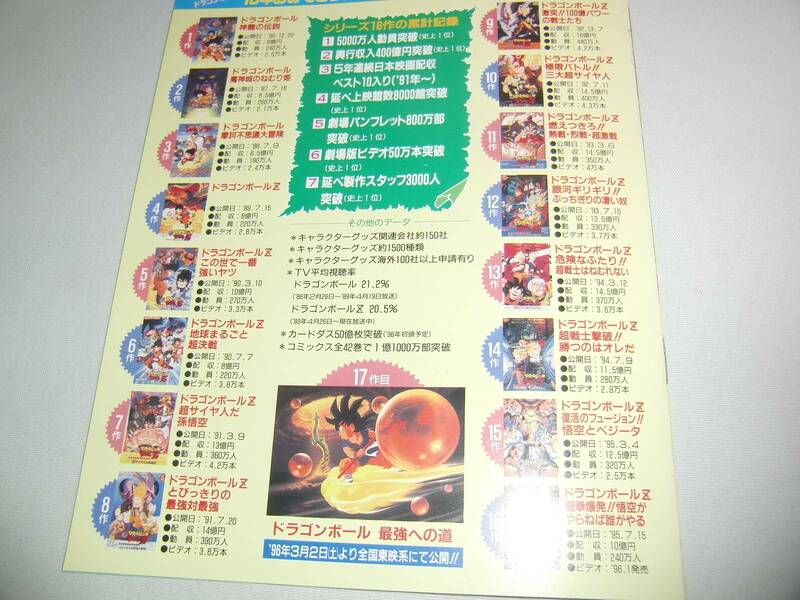 ^ The first sixteen Dragon Ball films, from Dragon Ball: Curse of the Blood Rubies (1986) to Dragon Ball Z: Wrath of the Dragon (1995), had a total combined box office gross of over ¥40 billion, according to Toei Animation. ^ The film grossed $52,761,356 worldwide, including $32 million in Japan, $2.8 million in the US and Canada, and $17,961,356 in other territories. ^ a b "88TH ACADEMY AWARDS OF MERIT" (PDF). Academy of Motion Picture Arts and Sciences. ^ Guinness World Records. 60 (2015 ed.). 2014. pp. 160–161. ISBN 9781908843708. The 2015 edition of Guinness World Records does not provide an explicit figure for Snow White and the Seven Dwarfs. However, it does state that it is one of only two pre-1955 films—the other being Gone with the Wind—that are among the adjusted top ten. It placed tenth in the 2012 edition, and the eleventh highest-grossing film according to the 2015 edition is The Exorcist, which has grossed $1.794 billion adjusted to 2014 prices. The adjusted grosses for the other films on the chart increased by 4.2 percent between 2011 and 2014 according to Guinness, and using this apparent rate of inflation would take the adjusted gross for Snow White from $1.746 billion at 2011 prices to $1.819 billion at 2014 prices. ^ "Animation". Box Office Mojo. Retrieved May 14, 2016. ^ "Animation - Computer". Box Office Mojo. Retrieved October 13, 2010. ^ "Animation - Stop Motion". Box Office Mojo. Retrieved August 25, 2016. ^ a b 予約特典・ドラゴンボール最強への道・劇場版ご近所物語A5サイズ前売特典冊子. Toei Animation. 1996. p. 8. Archived from the original on 2013-06-28. Retrieved 2019-01-25. ^ "Currency converter in the past with official exchange rates from 1953". fxtop.com. Retrieved 12 February 2019. ^ "Dragon Ball Super: Broly (2019)". Box Office Mojo. Retrieved March 28, 2019. ^ ""Dragon Ball Z Resurrection F" Won the Japan Academy Prize for Best Animated Film at the 39th Japan Academy Awards! The movie was released in 45 countries worldwide and became a smash hit, making 7.7 billion yen at the box office!!". Toei Animation. Archived from the original on 2019-01-24. Retrieved January 23, 2019. ^ "Toei Aims for 3 Billion Yen for 2013 Dragon Ball Z Film". Anime News Network. March 24, 2013. Archived from the original on 2013-03-27. Retrieved April 1, 2013. ^ ""Dragon Ball Z: Resurrection 'F'" Books Back-To-Back Record Box Offices On First Two Days Of Run". PR Newswire. Funimation. Retrieved December 30, 2016. ^ "Dragon Ball Z: Battle of Gods (2014) - Foreign". Box Office Mojo. Archived from the original on 2016-12-30. Retrieved December 30, 2016. "Frozen (2013) – International Box Office Results: United Kingdom". Box Office Mojo. Retrieved January 24, 2015. ^ a b c "Incredibles 2 (2018)". Box Office Mojo. Retrieved March 25, 2019. ^ a b c "Minions (2015)". Box Office Mojo. Retrieved April 18, 2016. ^ a b c d "Toy Story 3 (2010)". Box Office Mojo. Retrieved April 6, 2011. ^ "Animation Movies at the Box Office". Box Office Mojo. Archived from the original on August 23, 2010. ^ a b c "Despicable Me 3 (2017)". Box Office Mojo. Retrieved January 12, 2018. ^ a b c "Finding Dory (2016)". Box Office Mojo. Retrieved April 10, 2017. ^ a b "Zootopia (2016)". Box Office Mojo. Retrieved December 30, 2016. ^ a b "Despicable Me 2 (2013)". Box Office Mojo. Retrieved July 14, 2013. ^ "Animation Movies at the Box Office". Box Office Mojo. Archived from the original on January 22, 2014. ^ a b "The Lion King (1994)". Box Office Mojo. Retrieved November 13, 2011. ^ a b c d e f La Ganga, Maria L. (October 28, 2001). "A Very Scary Business". Los Angeles Times. p. 5. Retrieved December 26, 2014. ^ a b c "Finding Nemo (2003)". Box Office Mojo. Retrieved October 12, 2010. ^ a b c d "Shrek 2 (2004)". Box Office Mojo. Retrieved October 12, 2010. ^ "Animation Movies at the Box Office". Box Office Mojo. Archived from the original on April 18, 2006. ^ a b c "Ice Age: Dawn of the Dinosaurs (2009)". Box Office Mojo. Retrieved October 12, 2010. ^ "Animation Movies at the Box Office". Box Office Mojo. Archived from the original on October 3, 2009. ^ a b c "Ice Age: Continental Drift (2012)". Box Office Mojo. Retrieved August 4, 2012. ^ "Animation Movies at the Box Office". Box Office Mojo. Archived from the original on September 4, 2012. ^ a b "The Secret Life of Pets". Box Office Mojo. Retrieved January 28, 2017. ^ a b "Inside Out (2015)". Box Office Mojo. Retrieved April 21, 2016. ^ a b "Coco (2017)". Box Office Mojo. Retrieved July 30, 2018. ^ a b c "Shrek the Third (2007)". Box Office Mojo. Retrieved October 12, 2010. ^ "Animation Movies at the Box Office". Box Office Mojo. Archived from the original on October 1, 2007. ^ a b "Shrek Forever After (2010)". Box Office Mojo. Retrieved April 6, 2011. ^ "Animation Movies at the Box Office". Box Office Mojo. Archived from the original on November 20, 2010. ^ a b "Madagascar 3: Europe's Most Wanted (2012)". Box Office Mojo. Retrieved July 1, 2012. ^ "Animation Movies at the Box Office". Box Office Mojo. Archived from the original on November 19, 2012. ^ a b "Monsters University (2013)". Box Office Mojo. Retrieved July 14, 2013. ^ "Animation Movies at the Box Office". Box Office Mojo. Archived from the original on September 28, 2013. ^ a b "Up (2009)". Box Office Mojo. Retrieved October 12, 2010. ^ "Animation Movies at the Box Office". Box Office Mojo. Archived from the original on December 13, 2009. ^ a b c "Kung Fu Panda 2 (2011)". Box Office Mojo. Retrieved September 29, 2011. ^ "Animation Movies at the Box Office". Box Office Mojo. Archived from the original on October 11, 2011. ^ a b c "Ice Age: The Meltdown (2006)". Box Office Mojo. Retrieved July 12, 2018. ^ "Animation Movies at the Box Office". Box Office Mojo. Archived from the original on June 13, 2006. ^ a b c "Big Hero 6 (2014)". Box Office Mojo. Retrieved September 2, 2015. ^ "Animation Movies at the Box Office". Box Office Mojo. Archived from the original on June 26, 2015. ^ a b "Moana (2016)". Box Office Mojo. Retrieved October 23, 2017. ^ a b "Sing (2016)". Box Office Mojo. Retrieved December 10, 2017. ^ a b "The Incredibles (2004)". Box Office Mojo. Retrieved October 12, 2010. ^ a b "Animation Movies at the Box Office". Box Office Mojo. Archived from the original on April 18, 2006. ^ a b c "Kung Fu Panda (2008)". Box Office Mojo. Retrieved October 12, 2010. ^ "Animation Movies at the Box Office". Box Office Mojo. Archived from the original on December 16, 2008. ^ a b "How to Train Your Dragon 2 (2014)". Box Office Mojo. Retrieved December 17, 2014. ^ a b "Animation Movies at the Box Office". Box Office Mojo. Archived from the original on September 9, 2014. ^ a b "Ratatouille (2007)". Box Office Mojo. Retrieved October 12, 2010. ^ a b "All Time - Worldwide". Box Office Mojo. Archived from the original on May 9, 2008. ^ a b "Madagascar: Escape 2 Africa (2008)". Box Office Mojo. Retrieved October 12, 2010. ^ "Animation Movies at the Box Office". Box Office Mojo. Archived from the original on February 1, 2009. ^ a b "Tangled (2010)". Box Office Mojo. Retrieved July 20, 2011. ^ a b "Animation Movies at the Box Office". Box Office Mojo. Archived from the original on June 7, 2011. ^ a b "The Croods (2013)". Box Office Mojo. Retrieved April 7, 2013. ^ "Animation Movies at the Box Office". Box Office Mojo. Archived from the original on July 14, 2013. ^ a b c "Monsters, Inc. (2001)". Box Office Mojo. Retrieved October 12, 2010. ^ "All Time - Worldwide". Box Office Mojo. Archived from the original on October 1, 2002. ^ a b "Cars 2 (2011)". Box Office Mojo. Retrieved July 19, 2011. ^ "Animation Movies at the Box Office". Box Office Mojo. Archived from the original on September 16, 2011. ^ a b "Puss in Boots (2011)". Box Office Mojo. Retrieved May 26, 2012. ^ "Animation Movies at the Box Office". Box Office Mojo. Archived from the original on April 13, 2012. ^ a b "Despicable Me (2010)". Box Office Mojo. Retrieved April 6, 2011. ^ a b "Brave (2012)". Box Office Mojo. Retrieved January 29, 2013. ^ a b "WALL-E (2008)". Box Office Mojo. Retrieved October 12, 2010. ^ "All Time - Worldwide". Box Office Mojo. Archived from the original on December 25, 2008. ^ a b c "Madagascar (2005)". Box Office Mojo. Retrieved October 12, 2010. ^ a b "Ralph Breaks the Internet (2018)". Box Office Mojo. Retrieved April 22, 2019. ^ a b "Hotel Transylvania 3: Summer Vacation (2018)". Box Office Mojo. Retrieved February 22, 2019. ^ a b "The Boss Baby (2017)". Box Office Mojo. Retrieved April 22, 2018. ^ a b "The Simpsons Movie (2007)". Box Office Mojo. Retrieved October 12, 2010. ^ "All Time - Worldwide". Box Office Mojo. Archived from the original on October 28, 2007. ^ a b "Kung Fu Panda 3 (2016)". Box Office Mojo. Retrieved August 3, 2016. ^ a b c "How to Train Your Dragon: The Hidden World (2019)". Box Office Mojo. Retrieved April 22, 2019. ^ a b "Dr. Seuss' The Grinch (2018)". Box Office Mojo. Retrieved April 12, 2019. ^ a b c d "Aladdin (1992)". Box Office Mojo. Retrieved October 12, 2010. ^ a b "Rio 2 (2014)". Box Office Mojo. Retrieved December 6, 2014. "Toy Story 2 (1999)". Box Office Mojo. Retrieved October 12, 2010. "Toy Story 2 3D (2009)". Box Office Mojo. Retrieved February 3, 2015. ^ "Animation - Computer". Box Office Mojo. Archived from the original on April 4, 2014. ^ a b "Animation - Computer". Box Office Mojo. Archived from the original on November 20, 2010. ^ "Animation - Computer". Box Office Mojo. Archived from the original on January 22, 2014. ^ a b "Animation - Computer". Box Office Mojo. Archived from the original on August 3, 2004. ^ "Animation - Computer". Box Office Mojo. Archived from the original on October 13, 2004. ^ "Animation - Computer". Box Office Mojo. Archived from the original on October 5, 2009. ^ "Animation - Computer". Box Office Mojo. Archived from the original on August 30, 2012. ^ "Animation - Computer". Box Office Mojo. Archived from the original on October 26, 2007. ^ a b "Animation - Computer". Box Office Mojo. Archived from the original on December 9, 2012. ^ "Animation - Computer". Box Office Mojo. Archived from the original on September 29, 2013. ^ "Animation - Computer". Box Office Mojo. Archived from the original on December 20, 2009. ^ a b "Animation - Computer". Box Office Mojo. Archived from the original on October 15, 2011. ^ "Animation - Computer". Box Office Mojo. Archived from the original on July 9, 2006. ^ "Animation - Computer". Box Office Mojo. Archived from the original on June 26, 2015. ^ a b "Animation - Computer". Box Office Mojo. Archived from the original on April 17, 2006. ^ "Animation - Computer". Box Office Mojo. Archived from the original on December 16, 2008. ^ a b "Animation - Computer". Box Office Mojo. Archived from the original on September 9, 2014. ^ "Animation - Computer". Box Office Mojo. Archived from the original on February 23, 2009. ^ a b "Animation - Computer". Box Office Mojo. Archived from the original on June 6, 2011. ^ "All Time - Worldwide". Box Office Mojo. Archived from the original on June 2, 2013. ^ "Animation - Computer". Box Office Mojo. Archived from the original on May 1, 2012. ^ "Animation - Computer". Box Office Mojo. Archived from the original on December 1, 2008. ^ "How to Train Your Dragon (2010)". Box Office Mojo. Retrieved January 22, 2011. ^ "All Time - Worldwide". Box Office Mojo. Archived from the original on September 19, 2010. ^ "Rio (2011)". Box Office Mojo. Retrieved February 3, 2019. ^ "Animation - Computer". Box Office Mojo. Archived from the original on January 1, 2012. ^ "Shrek (2001)". Box Office Mojo. Retrieved October 12, 2010. ^ "Chicken Run (2000)". Box Office Mojo. Retrieved September 26, 2015. ^ "Wallace & Gromit: The Curse of the Were-Rabbit (2005)". Box Office Mojo. Retrieved September 26, 2015. ^ "Coraline (2009)". Box Office Mojo. Retrieved September 26, 2015. ^ "The Pirates! In an Adventure with Scientists! (2012)". Box Office Mojo. Retrieved September 26, 2015. ^ "Tim Burton's Corpse Bride (2005)". Box Office Mojo. Retrieved September 26, 2015. ^ "The Boxtrolls (2014)". Box Office Mojo. Retrieved September 26, 2015. ^ "ParaNorman (2012)". Box Office Mojo. Retrieved September 26, 2015. ^ "Shaun the Sheep Movie (2015)". Box Office Mojo. Retrieved September 20, 2016. ^ "The Little Prince (2015)". Box Office Mojo. Retrieved 21 April 2016. ^ a b "The Nightmare Before Christmas (1993)". Box Office Mojo. Retrieved August 29, 2014. ^ "Frankenweenie (2012)". Box Office Mojo. Retrieved September 26, 2015. ^ "Kubo and the Two Strings (2016)". Box Office Mojo. Retrieved October 31, 2016. ^ "Isle of Dogs (2018)". Box Office Mojo. Retrieved September 30, 2018. ^ "Early Man (2018)". Box Office Mojo. Retrieved March 28, 2019. ^ "Fantastic Mr. Fox (2009)". Box Office Mojo. Retrieved 20 December 2015. ^ "James and the Giant Peach (1996)". Box Office Mojo. Retrieved 20 December 2015. ^ "Missing Link (2019)". Box Office Mojo. Retrieved 21 April 2019. ^ "Solan & Ludvig (2013)". Box Office Mojo. Retrieved 18 September 2016. ^ "Tarzan (1999)". Box Office Mojo. Retrieved October 13, 2010. ^ a b "Beauty and the Beast (1991)". Box Office Mojo. Retrieved March 21, 2012. ^ a b "Snow White and the Seven Dwarfs (1937)". IMDb. Retrieved 18 December 2015. Total prior to 50th anniversary reissue: Culhane, John (July 12, 1987). "'Snow White' At 50: Undimmed Magic". The New York Times. Retrieved June 29, 2014. By now, it has grossed about $330 million worldwide - so it remains one of the most popular films ever made. ^ a b c d e f g h Anthony D'Alessandro (October 27, 2003). "Cartoon Coffers - Top-Grossing Disney Animated Features at the Worldwide B.O.". Variety. p. 6. "Your Name (2017)". Box Office Mojo. Retrieved January 19, 2018. "Your Name - International: Germany". Box Office Mojo. Retrieved January 19, 2018. ^ "Pocahontas (1995)". Box Office Mojo. Retrieved September 26, 2015. ^ a b "The Hunchback of Notre Dame (1996)". Box Office Mojo. Retrieved August 29, 2014. ^ "The SpongeBob Movie: Sponge Out of Water (2015)". Box Office Mojo. Retrieved December 8, 2015. ^ "Mulan (1998)". Box Office Mojo. Retrieved September 26, 2015. "Spirited Away (2002) – International Box Office Results". Box Office Mojo. Retrieved July 1, 2014. Schwarzacher, Lukas (February 17, 2002). "Japan box office 'Spirited Away'". Variety. Retrieved August 21, 2014. Schwarzacher, Lukas (February 16, 2003). "H'wood eclipses local fare". Variety. Retrieved August 21, 2014. Schilling, Mark (May 16, 2008). "Miyazaki's animated pic to open this summer". Variety. Retrieved July 2, 2014. ^ "Lilo & Stitch (2002)". Box Office Mojo. Retrieved September 26, 2015. ^ a b "Bambi (1942)". Box Office Mojo. Retrieved September 3, 2014. ^ "The Princess and the Frog (2009)". Box Office Mojo. Retrieved September 26, 2015. ^ "Cinderella". The Numbers. Retrieved December 11, 2015. ^ a b "Hercules (1997)". Box Office Mojo. Retrieved August 29, 2014. ^ "Brother Bear (2003)". Box Office Mojo. Retrieved September 26, 2015. ^ "Howl's Moving Castle (2005)". Box Office Mojo. Retrieved September 26, 2015. ^ "The Prince of Egypt (1998)". Box Office Mojo. Retrieved September 26, 2015. ^ a b "101 Dalmatians (1961)". Boxoffice. Archived from the original on July 10, 2013. Retrieved August 29, 2014. ^ a b "The Little Mermaid (1989)". Box Office Mojo. Retrieved August 29, 2014. ^ "Ponyo (2009)". Box Office Mojo. Retrieved September 26, 2015. ^ "Atlantis: The Lost Empire (2001)". Box Office Mojo. Retrieved September 26, 2015. ^ "The Emperor's New Groove (2000)". Box Office Mojo. Retrieved September 26, 2015. ^ "Pokémon: The First Movie (1999)". Box Office Mojo. Retrieved September 26, 2015. ^ "Princess Mononoke (1999)". Box Office Mojo. Retrieved September 26, 2015. ^ "The Secret World of Arrietty (2012)". Box Office Mojo. Retrieved September 26, 2015. ^ a b "Peter Pan (1953) – Notes". Turner Classic Movies. Retrieved August 29, 2014. ^ "The Rugrats Movie (1998)". Box Office Mojo. Retrieved September 26, 2015. ^ "The SpongeBob SquarePants Movie (2004)". Box Office Mojo. Retrieved September 26, 2015. ^ "Anastasia (1997)". Box Office Mojo. Retrieved September 26, 2015. ^ "Kaze tachinu". IMDb. Retrieved 18 December 2015. ^ "The Jungle Book 2 (2003)". Box Office Mojo. Retrieved September 26, 2015. ^ "Pokémon: The Movie 2000 (2000)". Box Office Mojo. Retrieved September 26, 2015. ^ "Spirit: Stallion of the Cimarron (2002)". Box Office Mojo. Retrieved September 26, 2015. ^ a b "Pinocchio". Box Office. Archived from the original on December 19, 2014. Retrieved September 28, 2014. ^ "Dragon Ball Super: Broly (2019)". Box Office Mojo. Retrieved April 11, 2019. ^ "Return to Never Land (2002)". Box Office Mojo. Retrieved September 26, 2015. ^ "Treasure Planet (2002)". Box Office Mojo. Retrieved September 26, 2015. ^ "Meitantei Conan: Zero no Shikkônin (2018)". The Numbers. Retrieved February 17, 2019. ^ "Home on the Range (2004)". Box Office Mojo. Retrieved September 26, 2015. ^ "Rugrats in Paris: The Movie (2000)". Box Office Mojo. Retrieved September 26, 2015. ^ "The Tigger Movie (2000)". Box Office Mojo. Retrieved September 26, 2015. ^ "Fantasia 2000 (35mm & IMAX) (2000)". Box Office Mojo. Retrieved September 26, 2015. ^ a b Robinson, Tasha (December 6, 2000). "Ralph Bakshi - Interview". A.V. Club. Retrieved September 6, 2014. And Fritz was a $700,000 picture that made $90 million worldwide, and is still playing. ^ "Worldwide 2010 box office". Box Office Mojo. Retrieved August 29, 2014. ^ "Worldwide Box Office Results". Box Office Mojo. Retrieved July 29, 2015. ^ Stack, Peter. "Reawakening the Giant / Producer, sound man revive classic 'Gulliver's Travels'". SF Gate. Retrieved August 29, 2014. ^ "Gulliver's Travels (1939) - Notes - TCM.com". Turner Classic Movies. Retrieved June 19, 2015. ^ a b Barrier, Michael (2003). Hollywood Cartoons: American Animation in Its Golden Age. New York: Oxford University Press. p. 266. ISBN 9780199839223. The film's negative cost was $2.6 million, more than $1 million higher than Snow White's. ^ "Dumbo". Box Office Mojo. Retrieved August 29, 2014. ^ "Victory Through Air Power". Internet Movie Database. Retrieved August 29, 2014. ^ a b c d e "Richard B. Jewell's RKO film grosses, 1929–51: The C. J. Trevlin Ledger: A comment". Historical Journal of Film, Radio and Television, Volume 14, Issue 1, 1994. ^ "The Three Caballeros". American Film Institute Catalog. Retrieved August 30, 2014. ^ "The Enchanted Sword". Internet Movie Database. Retrieved August 29, 2014. ^ Abraham, Adam. When Magoo Flew: The Rise and Fall of Animation Studio UPA. Wesleyan University Press. p. 189. ISBN 978-0-8195-7270-7. ^ "109 Million Techni Sked". Variety. February 18, 1948. p. 14. ^ "Cinderella (1950)". Boxoffice. Archived from the original on July 10, 2013. Retrieved August 29, 2013. ^ "Magical Kingdoms". Retrieved 30 September 2014. ^ "Lady and the Tramp (1955) – Notes". Turner Classic Movies. Retrieved August 29, 2014. ^ "Sleeping Beauty (1959)". Box Office Mojo. Retrieved August 29, 2014. ^ Schickel, Richard (1968). The Disney Version: The Life, Times, Art and Commerce of Walt Disney. Chicago: Simon & Schuster. p. 299. ISBN 1-5666-3158-0. ^ Reid, John Howard (2005). Success in the Cinema: Money-Making Movies and Critics' Choices. Raleigh, North Carolina: Lulu. p. 43. ISBN 1-8472-8088-9. ^ "One Hundred and One Dalmatians". Variety. December 31, 1960. Retrieved August 29, 2014. ^ "The Sword in the Stone". The Numbers. Retrieved August 29, 2014. ^ Thomas, Bob (November 1, 1963). "Walt Disney Eyes New Movie Cartoon". Sarasota Journal. Retrieved August 29, 2018. ^ "Big Rental Pictures of 1964", Variety, January 6, 1965 p 39. ^ "Hey There, It's Yogi Bear (re-issue)". Box Office Mojo. Retrieved August 29, 2014. ^ "Hey There, It's Yogi Bear". The Numbers. Retrieved August 29, 2014. ^ "Big Rental Pictures of 1964", Variety, 6 January 1965 p 39. ^ "Animals Portray Parts in Disney's "Robin Hood"". Toledo Blade. October 18, 1970. Retrieved July 4, 2016. ^ "The Jungle Book". Variety. December 31, 1966. Retrieved March 14, 2018. ^ "A Boy Named Charlie Brown". Internet Movie Database. Retrieved August 29, 2014. ^ "Schulz, Charlie Brown Finally Make It to the Movies: Peanuts Makes It to the Movies" by Warga, Wayne. Los Angeles Times (1923-Current File) [Los Angeles, CA] 29 Mar 1970. ^ "The Aristocats". Internet Movie Database. Retrieved August 29, 2014. ^ "Magical Kingdoms". Magical Kingdoms. 1970-12-24. Retrieved August 29, 2014. ^ "Daisy Town". Internet Movie Database. Retrieved August 29, 2014. ^ "Robin Hood". The Numbers. Retrieved August 29, 2014. ^ Huddy, John (November 7, 1973). "Disney Coming Out with "Robin Hood"". Toledo Blade. Retrieved August 28, 2018. ^ "Robin Hood". Internet Movie Database. Retrieved August 29, 2014. ^ "Dunderklumpen! (1974)". Internet Movie Database. Retrieved July 5, 2015. ^ "The Pinchcliffe Grand Prix (1975)". Internet Movie Database. Retrieved July 5, 2015. ^ "A Rally For G Ratings Clubhouse Gets Bandwagon Rolling For Family Entertainment". Orlando Sentinel. Retrieved August 29, 2014. ^ "The Rescuers Review". Variety. 1977. Retrieved August 28, 2018. ^ "The Lord of the Rings (1978)". Box Office Mojo. Retrieved August 29, 2014. ^ Beck, Jerry (2005). "The Lord of the Rings". The Animated Movie Guide. Chicago Review Press. p. 155. ISBN 978-1-55652-591-9. ^ "Currency converter in the past with official exchange rates from 1953". fxtop.com. Retrieved March 6, 2018. ^ "Kako haikyū shūnyū jōi sakuhin 1980-nen". Motion Picture Producers Association of Japan. Retrieved May 1, 2017. ^ "Currency converter in the past with official exchange rates from 1953". fxtop.com. Retrieved May 1, 2017. ^ "The Fox and the Hound (1981)". Box Office Mojo. Retrieved August 29, 2014. ^ Ansen, David (July 13, 1981). "Forest Friendship". Newsweek: 81. ^ "The Secret of NIMH (1982)". Box Office Mojo. Retrieved August 29, 2014. ^ Cawley, John (October 1991). "The Secret of N.I.M.H.". The Animated Films of Don Bluth. Image Pub of New York. ISBN 0-685-50334-8. ^ "Kako haikyū shūnyū jōi sakuhin 1980-nen". Motion Picture Producers Association of Japan. Retrieved March 6, 2018. ^ Sources differ as to the actual cost of The Care Bears Movie. US$2 million: Foley (2003), Stewart (2005) Stewart, James B. (2005). "The Wonderful World of Disney". DisneyWar. Simon & Schuster. p. 70. ISBN 0-684-80993-1. ^ "An American Tail (1986)". Box Office Mojo. Retrieved August 29, 2014. ^ "The Land Before Time". Boxoffice. Retrieved August 29, 2014. ^ "The Land Before Time". Internet Movie Database. Retrieved August 29, 2014. ^ Stewart, James B. (2005). DisneyWar, p. 104. ISBN 0-684-80993-1. Simon & Schuster. Retrieved August 4, 2014. ^ "The Rescuers Down Under (1990)". IMDB. Retrieved February 3, 2016. ^ Mark Salisbury, Tim Burton (2006). Burton on Burton. London: Faber and Faber. pp. 121–127. ISBN 0-571-22926-3. "Toy Story (1995)". Box Office Mojo. Retrieved October 13, 2010. "Toy Story (3D)". Box Office Mojo. Retrieved October 13, 2010. ^ "Toy Story". Internet Movie Database. Retrieved August 29, 2014. ^ "A Bug's Life (1998)". Box Office Mojo. Retrieved October 13, 2010. ^ "Toy Story 2 (3D)". Box Office Mojo. Retrieved November 19, 2014. ^ "Dinosaur (2000)". Box Office Mojo. Retrieved August 29, 2014. ^ "Ice Age (2002)". Box Office Mojo. Retrieved October 13, 2010. ^ "Pixar's most (and least) successful movies at the box office, ranked". Business Insider. Retrieved July 25, 2018. ^ Block, Alex Ben; Wilson, Lucy Autrey, eds. (2010). George Lucas's Blockbusting: A Decade-By-Decade Survey of Timeless Movies Including Untold Secrets of Their Financial and Cultural Success. HarperCollins. p. 255. ISBN 9780061778896. On its initial release Pinocchio brought in only $1.6 million in domestic rentals (compared with Snow White's $4.2 million) and $1.9 million in foreign rentals (compared with Snow White's $4.3 million)." "Franchise Index". Box Office Mojo. Retrieved January 3, 2013. "Boonie Bears: Homeward Journey". Box Office Mojo. Retrieved March 8, 2019. "Boonie Bears: Robo-Rumble". Box Office Mojo. Retrieved March 8, 2019. "Boonie Bears, to the Rescue!". Box Office Mojo. Retrieved March 8, 2019. "Boonie Bears: Mystical Winter". Box Office Mojo. Retrieved March 8, 2019. "Boonie Bears III". Box Office Mojo. Retrieved March 8, 2019. "Boonie Bears: Entangled Worlds". Box Office Mojo. Retrieved March 8, 2019. "Boonie Bears: The Big Shrink". Box Office Mojo. Retrieved March 8, 2019. "Boonie Bears: Blast Into the Past". Box Office Mojo. Retrieved March 8, 2019. "Cars – Worldwide (Unadjusted)". Box Office Mojo. Retrieved June 21, 2017. "Planes (2013)". Box Office Mojo. Retrieved December 22, 2015. "Planes: Fire & Rescue (2014)". Box Office Mojo. Retrieved December 22, 2015. 1997 film: "Meitantei Conan: Tokei-jikake no matenrou (1997)". Internet Movie Database. Retrieved May 5, 2017. 2002 film: "Detective Conan: The Phantom of Baker Street (2002)". Box Office Mojo. Retrieved May 4, 2017. 2003 film: "Detective Conan: Crossroad in the Ancient Capital (2003)". Box Office Mojo. Retrieved May 4, 2017. 2004 film: "Detective Conan: Magician of the Silver Sky (2004)". Box Office Mojo. Retrieved May 4, 2017. 2005 film: "Detective Conan: Strategy Above the Depths (2005)". Box Office Mojo. Retrieved May 4, 2017. 2006 film: "Detective Conan: The Private Eyes' Requiem (2006)". Box Office Mojo. Retrieved May 4, 2017. 2007 film: "Detective Conan: Jolly Roger in the Deep Azure (2007)". Box Office Mojo. Retrieved May 4, 2017. 2008 film: "Detective Conan: Full Score of Fear (2008)". Box Office Mojo. Retrieved May 4, 2017. "Detective Conan: Full Score of Fear (2019 re-release)". Box Office Mojo. Retrieved February 22, 2019. 2009 film: "Detective Conan: The Raven Chaser (2009)". Box Office Mojo. Retrieved May 4, 2017. 2010 film: "Meitantei Konan: Tenkuu no rosuto shippu (2010)". Box Office Mojo. Retrieved May 4, 2017. 2011 film: "Detective Conan: Quarter of Silence (2011)". Box Office Mojo. Retrieved May 4, 2017. 2012 film: "Detective Conan: The Eleventh Striker (2012)". Box Office Mojo. Retrieved May 4, 2017. 2013 film: "Meitantei Conan Private Eye 2013 (2013)". Box Office Mojo. Retrieved May 4, 2017. 2014 film: "Meitantei Conan: Ijigen no sunaipa (2014)". Box Office Mojo. Retrieved May 4, 2017. 2015 film: "Detective Conan: Sunflowers of Inferno". Box Office Mojo. Retrieved May 4, 2017. 2016 film: "Detective Conan: The Darkest Nightmare". Box Office Mojo. Retrieved April 4, 2018. 2017 film: "Detective Conan: Crimson Love Letter". Box Office Mojo. Retrieved June 21, 2017. 2018 film: "Detective Conan: Zero The Enforcer". Box Office Mojo. Retrieved November 13, 2018. 2019 film: "Detective Conan: The Fist of Blue Sapphire". Box Office Mojo. Retrieved April 19, 2019. "Lupin III vs. Conan (2013)". Box Office Mojo. Retrieved May 4, 2017. "Cloudy with a Chance of Meatballs – Worldwide (Unadjusted)". Box Office Mojo. Retrieved October 29, 2017. "Despicable Me – Worldwide (Unadjusted)". Box Office Mojo. Retrieved July 3, 2017. 2002 film: "Doraemon: Nobita to Robotto ôkoku (2002)". Box Office Mojo. Retrieved May 1, 2017. 2003 film: "Doraemon: Nobita and the Wind Wizard (2003)". Box Office Mojo. Retrieved May 1, 2017. 2004 film: "Doraemon: Nobita no Wan Nyan Jikűden (2004)". Box Office Mojo. Retrieved May 1, 2017. 2006 film: "Doraemon: Nobita no kyôryű (2006)". Box Office Mojo. Retrieved May 1, 2017. 2007 film: "Doraemon the Movie: Nobita's New Great Adventure Into the Underworld - The Seven Magic Users (2007)". Box Office Mojo. Retrieved May 1, 2017. 2008 film: "Doraemon: Nobita to Midori no kyojinten (2008)". Box Office Mojo. Retrieved May 1, 2017. 2009 film: "Eiga doraemon: Shin. Nobita no uchű kaitakushi". Box Office Mojo. Retrieved May 1, 2017. 2010 film: "Eiga Doraemon: Nobita no ningyo daikaisen". Box Office Mojo. Retrieved May 1, 2017. 2011 film: "Eiga Doraemon Shin Nobita to tetsujin heidan: Habatake tenshitachi". Box Office Mojo. Retrieved May 1, 2017. 2012 film: "Eiga Doraemon: Nobita to kiseki no shima - Animaru adobenchâ". Box Office Mojo. Retrieved May 1, 2017. 2013 film: "Doraemon Himitsu No Dogu Museum". Box Office Mojo. Retrieved May 1, 2017. 2014 film: "Doraemon Himitsu No Dogu Museum". Box Office Mojo. Retrieved May 1, 2017. Stand by Me Doraemon: "Stand by Me Doraemon". Box Office Mojo. Retrieved May 1, 2017. 2015 film: "Eiga Doraemon Nobita no Space Heroes". Box Office Mojo. Retrieved May 1, 2017. 2016 film: "Eiga Doraemon: Shin Nobita no Nippon tanjou". Box Office Mojo. Retrieved May 1, 2017. "Doraemon: Great Adventure in the Antarctic". Box Office Mojo. Retrieved May 1, 2017. "Doraemon: Great Adventure in the Antarctic Kachi Kochi". Box Office Mojo. Retrieved June 21, 2017. 2018 film: "Doraemon the Movie: Nobita's Treasure Island". Box Office Mojo. Retrieved June 5, 2018. 2019 film: "Doraemon: Nobita's Chronicle of the Moon Exploration". Box Office Mojo. Retrieved March 8, 2019. "Finding Nemo – Worldwide (Unadjusted)". Box Office Mojo. Retrieved October 12, 2010. "Happy Feet (2006)". Box Office Mojo. Retrieved October 13, 2010. "Happy Feet Two (2011)". Box Office Mojo. Retrieved October 13, 2010.